MANILA, Philippines - A video of 12-year-old pandesal seller is now viral online. 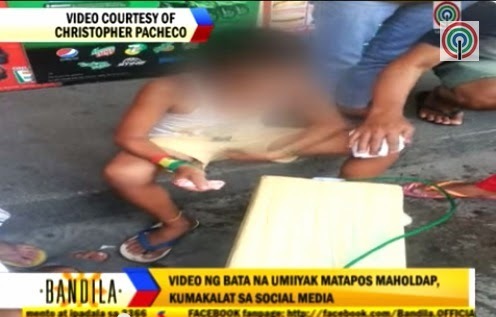 Netizens react as the boy was robbed of his almost P200 earnings in Deparo, Caloocan City. In a video posted by certain Christopher Pacheco on Facebook, the boy is seen crying, shaking, and visibly traumatized after the robbery. The thief stole close to P200 from the young pan de sal vendor after first buying bread from him. In an interview of DZMM to his mom Maricris, she said that had been selling pandesal before going to school to help the family and also augment his allowance. The boy also now fears going out of the house, thinking that the suspect might find him and attack him again especially after his story has gone viral. "Pauwi na po sana siya nang bigla daw pong may lumapit sa kanya. Tinakpan daw ang kanyang bibig at tinutukan po siya ng patalim sa tagiliran at kinuha po yung kanyang benta dun sa box," Maricris said in an interview with radio dzMM on Saturday morning. According to his mom, she wants the robber arrested immediately. "Masama po ang loob ko at saka masakit po sa dibdib. Galit po ako. Kung ako lang po, gusto ko pong mahuli para hindi na po siya makaperwisyo ng iba. Simple lang naman po ang kagustuhan ng bata para sa sarili niya. Ganung halaga tinalo niya pa talaga," she said. Maricris added, "Kung sino man siya, sana makonsensya naman po siya at sana po huwag niyang ulitin sa ibang tao kasi nakakaawa po ang mga bata." On social media, the video has called attention of netizens and celebrities with some want to offer help for the young boy. A Filipina living in Scotland Marlene Aro showed her sympathies and said that she, along with other members of the Filipino-Scottish community, are willing to send help for the boy. Meanwhile, Lee Je Woo asked for more information about the boy. "May contact po ba kayo sa bata? I wanna send him some money for his schooling. Please pm me if you have."